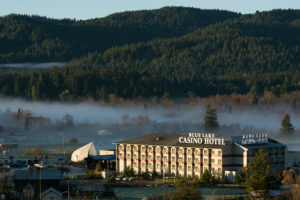 We offer the premier, affordable, luxury hotel – casino experience on California’s Redwood Coast! Our hotel amenities include room service, free Wi-Fi, an outdoor pool + spa, and safe storage. Our friendly staff provides the premier entertainment experience. We offer over 800 slots, Bigfoot Bonus Jackpots, a variety of Table Games 24/7/365, live Poker, and the Redwood Rewards Club. Our tiered club offers the most rewarding experience on the Redwood Coast – you’ll earn free play, hotel stays, dining comps, event tickets, and bonus offers! We offer four dining options. Experience Alice’s Restaurant, Sushi Blue, Wave Lounge, and the Lily Pad Cafe – breakfast, lunch, dinner, or late night – we’re here to satisfy 24/7/365! Experience free Live Music in the Wave Lounge every Friday and Saturday night! Join us for exclusive, intimate concerts in the Sapphire Palace! Experience our annual expos such as Comic Con or Inked Hearts! You can even book private events at our Blue Lake Amphitheater, Sapphire Palace or Kinetic Lounge!